Passiflora ‚Albert‘ ist die erste offiziell registrierte meiner selbst gezüchteten Hybriden, deshalb bin ich mächtig stolz auf sie;). Die Registrierung ist hier zu finden, Nummer 169 ist P. ‚Albert‘. Der Name sollte ein Geschenk an meinen gleichnamigen Mann sein, aber er hat nur gelacht. Die Passi blüht mit 4 cm Durchmesser in den Farben Weiß, Gelb und Grün. Die Außenseite der Blütenblätter ist grün, die Innenseite weiß mit grünem Rand. Der Strahlenkranz ist leuchtend gelb und wird zur Blütenmitte hin grün. 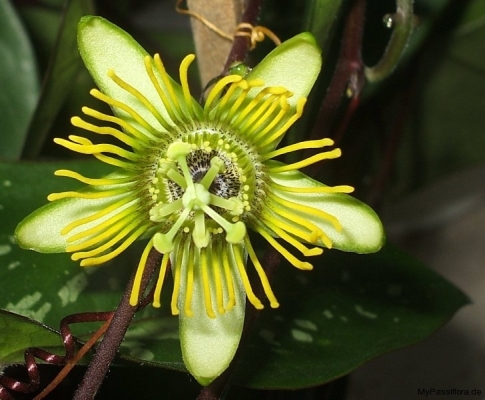 Passiflora ‚Albert‘ is a cross between Passiflora coriacea and Passiflora megacoriacea. Both parent plants belong to the subgenus decaloba, section cieca. These Passion Flowers have relatively thick leaves reminiding of leather. Their name derives from that fact. The leaves of P. coriacea are variegated with white-greenish spots. megacoriacea has plain green leaves. All parts of the plant are larger than with P. coriacea. Thus, the Passiflora was named megacoriacea (mega = groß). Passiflora ‚Albert‘ has unregular leaves, some of them are more variegated than others. To my eyes, this irregularity makes this Passi even more attractive. Passiflora ‚Albert‘ is my first officially registrated self-bred hybrid. So, I’m very proud of it. The registration list is linked here, P. ‚Albert‘ is #169. The flower has 4 cm in diameter and is colored in white and yellow. The petals are green on the outside, white with a green boundary on the inside. The corona is yellow, turning into green in the center. Naming the plant ‚Albert‘ was meant to be a present to my husband but he just laughed about it.